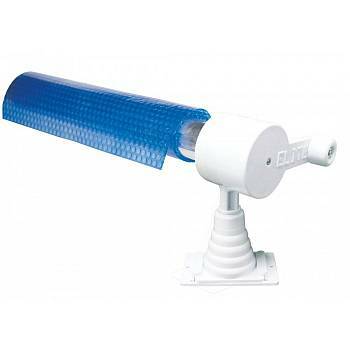 Solar Cover Reel for Above Ground Pools 25ft to 28ft wide. The Horizon Solar Cover Reel was manufactured specifically for Above Ground Swimming Pools. This Solar Reel can be easily operated by one person due to the special bearing systems at both ends of the reel. Having this solar reel makes using your solar cover so easy you will use it more often saving money on heating the pool so you can enjoy warmer water. The reel should be anchored to your pool's top rail which must be flat and at least 6 inches wide. The anchor design allows you to remove the reel (tubing) in the fall so a winter cover can easily be installed. The hand crank and bases are made of non corroding polymer so your reel will last year after year. This reel system also features a lift and swing feature that allows the reel and solar cover to be swung out of the way while you are enjoying your pool. Will fit either oval or round above ground pools and comes with the solar blanket attachment kit and installation instructions. Assembly is required and is backed by a 2 year warranty.